Shares of the one-stop shop for all things home continue to decline. Is it time to buy? 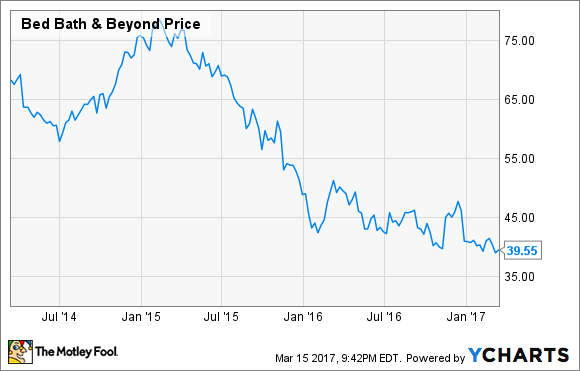 Bed Bath & Beyond (NASDAQ:BBBY) stock keeps getting cheaper, despite the company's efforts to return to growth. Now trading at less than 9 times expected 2017 earnings, shares may look like a value play to some investors, but caution is in order. The Bed Bath & Beyond family -- which includes the namesake stores, Cost Plus World Market, and Buy Buy Baby -- is facing a conundrum common to many other traditional retailers: falling foot traffic replaced by online sales. Data source: Bed Bath and Beyond quarterly earnings reports. The company has grown its store count and online presence, but that has been offset by the declining business at those stores. 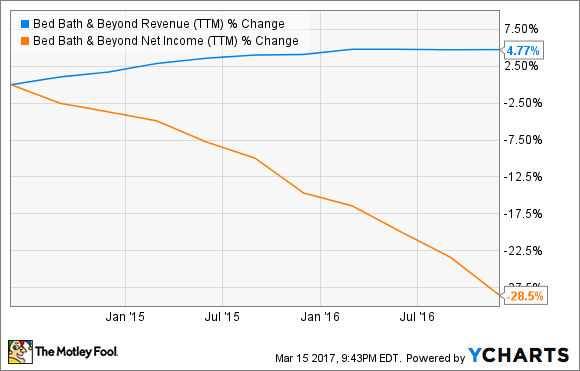 Bed Bath & Beyond has been spending money to maintain that top-line sales figure, but the lack of any real growth has eroded the bottom line. That free fall in profitability is concerning, and management has laid the blame on a competitive retail industry. The company has offered promotional shipping offers to keep up with nimble online peers like Amazon. The free shipping threshold was reduced from $49 to $29, at times offering free shipping on all purchases, during the most recent holiday season. Another reason for shrinking profits was coupon activity, resulting in lower sales prices at the counter. Bed Bath & Beyond hasn't reported its most recent holiday results yet (scheduled for April 5). Initial guidance, though, is for full-year comparable sales to have fallen half a percent and for profits to drop to the low end of its $4.50 to $5 per share guidance. Last year's earnings came in at $5.07. The silver lining here could be that profits have fallen, because management is investing for the future. That is similar to a strategy that Target recently unveiled after a disappointing holiday shopping season. However, a look at what Bed Bath and Beyond has done in the last year leaves me with doubts. Efforts to move the needle on the top line have revolved around investing in the digital store, making acquisitions, and opening new locations in the U.S. and Canada. On the first effort -- investing in and updating its digital efforts -- Bed Bath & Beyond has actually seen some success. In its last reported quarter, the company increased digital sales over 20%. The problem, though, is that this channel remains just a small slice of total revenue. The company decided to start investing in this model late in the game, and it has yet to develop the efficiency that larger online rivals already enjoy (read: affordable shipping costs and logistics). The second effort, closely related to the first, has been the company's acquisitions in the last year. Last summer was One Kings Lane, an online furniture and home décor company, which it bought for an undisclosed sum. Bed Bath & Beyond more recently purchased PersonalizationMall.com, an online seller of customizable goods, for $190 million in cash. Both companies are very small, and while they have helped keep total sales from sliding backwards, nothing meaningful has trickled down to the bottom line yet. As for the new store openings, at last report, Bed Bath & Beyond opened 18 net new stores in 2016 -- the total network is now over 1,500. Included in those new openings was the new Beyond at Liberty View in Brooklyn. The location houses a Bed Bath & Beyond, Buy Buy Baby, Cost Plus World Market, and Face Value store, as well as small shops and services like a restaurant and hair salon. It's an ambitious new location, but hardly a new idea, as it basically amounts to a mini-mall. Having established that declining foot traffic is a problem at the moment, opening big new locations is a risky move. Full-year 2017 guidance will be another item to watch on April 5. Any proof that the company's efforts are beginning to translate into sales and profitability growth will counter my bearish view. But until Bed Bath & Beyond can point to clear progress from these various initiatives, investors should be cautious with the stock.